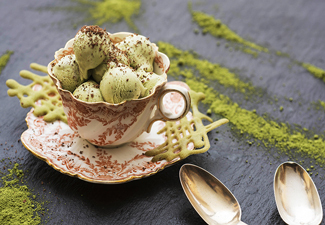 Put the matcha in a mug and add a teaspoon of boiling water and stir to a paste. Then very gradually add the warm milk and cream, stirring all the time until you have filled about half the mug and the matcha is fully disolved. Return this mixture to the rest of the milk and cream and whisk to combine. Add the roughly chopped white chocolate and stir until fully melted. Cool, churn and freeze in an ice-cream maker, following the manufacturer’s instructions. If you don’t have an ice-cream maker, tip the ice cream into a bowl, then put the bowl in the freezer until the ice cream starts to freeze around the edges. Stir well, then repeat the process twice more until the ice cream is smooth. Transfer to a sealable container for longer term storage.